For some tax filers, TaxSlayer is now the single best online filing option for 2018-2019 tax season. Why? TaxSlayer is the only company offering up to $1,000 advance on your tax return for qualified filers. This benefit is one typically reserved for brick and mortar filing companies like H&R Block and Jackson Hewitt. TaxSlayer calls their tax refund anticipation loan TaxSlayer’s Refund Advance (formerly refundNOW), and we'll talk about it more below. On top of the added return advance, TaxSlayer has improved their user experience with video tutorials, enhanced guided navigation, and increased ability to import prior tax forms. It’s also a potentially excellent choice for freelancers and side hustlers who don’t need guidance, since it makes all the “self-employment” forms available even in its free option – as long as you don’t need to call them up with tax questions. TaxSlayer should be a top contender for complex and simple filers alike. Let's dive in and see what makes TaxSlayer one of the best tax software choices of 2018-2019 tax season. Who Should Use TaxSlayer 2018-2019? TaxSlayer offers three forms of navigation. If you choose “Enter Myself,” you are taken to a list of forms (see screenshot.) 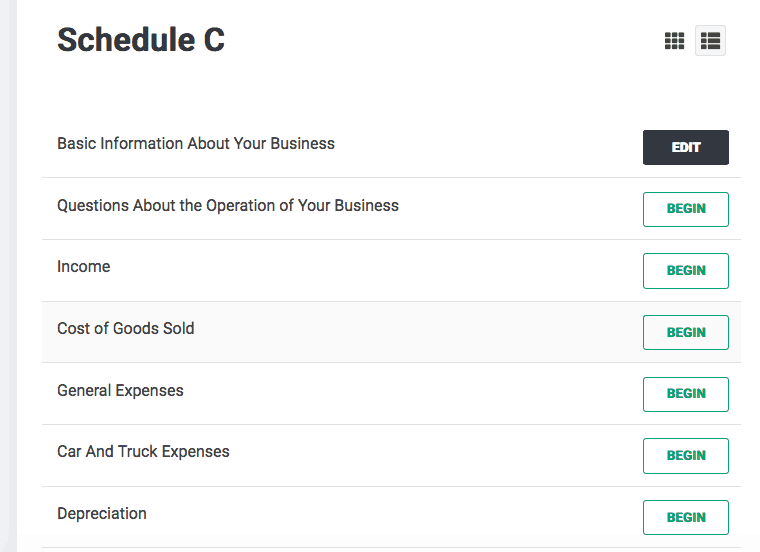 At this level of navigation, users can select from a list of income types, deductions, credits, etc. Most experienced filers will select this option, since the TaxSlayer menus are clear and easy to use. You can also choose “Guide Me” to allow the software to ask you questions. This guided navigation that uses questions and answers to help users determine what forms they need to enter. TaxSlayer’s guided navigation still falls short of TurboTax’s, but it is on par or ahead of TaxAct’s. Finally, you can use the menu on the left to navigate back and forth to different topics. Unlike some software you don’t need to enter earlier sections in order to reach the later sections but can move back and forth whenever you want. TaxSlayer allows users to import PDF versions of their previous tax returns. The import function worked well, and TaxSlayer used the information from the prior tax return to make my return easier. The only other import option that TaxSlayer has is the W-2 import option (which you can do with a photo application or by connecting to one of several major payroll providers). The lack of import options may be an issue for people who are active traders, or who want to connect their accounting software to their tax return. However, most other people will find that that TaxSlayer is easy to use. One small issue with TaxSlayer is in their depreciation and amortization schedules. These calculators do not auto-populate, so filers need to know what type of depreciation method they use. TaxSlayer does have knowledge articles about this. TaxSlayer isn’t as generous with their knowledge articles as top competitors H&R Block and TurboTax. However, TaxSlayer offers Video Tutorials in many parts of their software. These videos pack a ton of information into just a few minutes. For people who are used to searching YouTube for their information, these videos set a new standard for tax software. Their tax reform info center isn’t especially easy to find, but once you get there it has the basics. I also like their “glossary,” which lets you browse a lot of specialized terminology and get definitions. The TaxSlayer Simply Free edition has been updated for the new tax law and now enables free filers to claim student loan interest and education credits. It doesn’t have a W2 importer, but if you only have one or two W2s that’s probably not a big deal. As a freelancer, I’m pleased that the free option lets you do a basic Schedule C – something a lot of “free” software won’t allow you to add. This is place where their pay for service (instead of paying for forms) model really works for people who have somewhat complex taxes but are capable of filling out the forms without assistance. 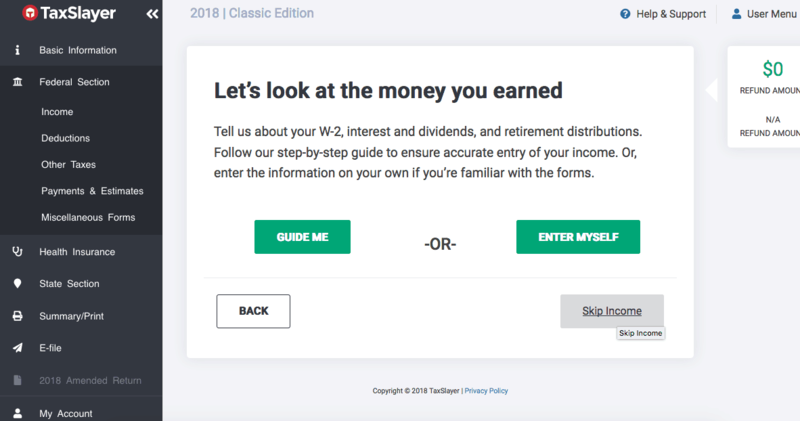 In 2019, TaxSlayer is offering their refund advance option to anyone using Classic, Premium, Self-Employed, or Ultimate (so anyone but free filers). The Classic option is low cost software that includes all major forms (including a business schedule C), but this version doesn’t come with audit assistance and help from tax professionals. The Premium and Self-Employed plans are nearly identical to the Classic option, but they come with live chat support and help from tax professionals and audit assistance. 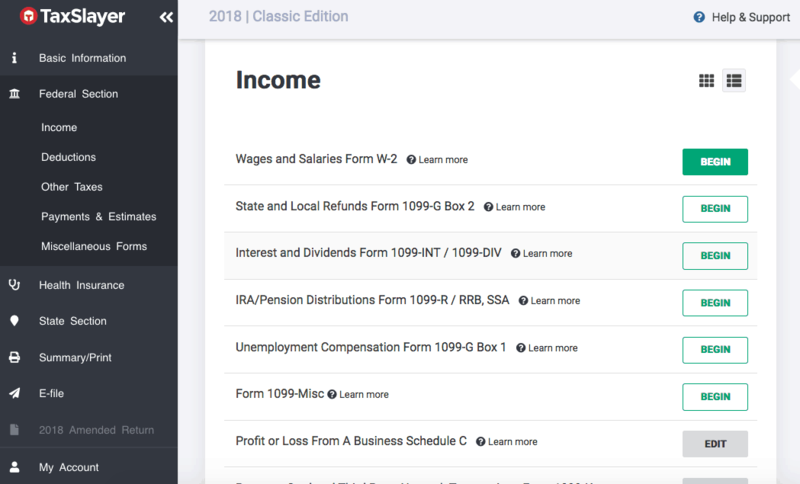 The Self-Employed version is also streamlined to help side-hustlers and contractors figure out their taxes, and it has dedicated support that lets you speak to a tax pro trained in 1099s and Schedule C.
People who want audit assistance and priority support. People who want self-employed tax assistance. Military Discount: In 2019, TaxSlayer Classic will be free to individuals and families with a military EIN for their Federal return. TaxSlayer is unique in that they are offering early tax refund anticipation loans for free for qualified filers online (who use Classic and higher). This used to be a service that you had to go into a traditional H&R Block or Jackson Hewitt to get. They offer two loan amounts - $500 or $1,000, and there are no upfront fees or interest. You should receive your loan within as little as 24 hours of IRS acceptance deposited onto your TaxSlayer Prepaid Visa® Debit Card powered by Green Dot. The loan amount will be deducted from the tax refund and reduces the refund amount disbursed directly to the taxpayer. The cool thing about this is that it's free, and can be done 100% online. This is a game changer for people looking to get their tax refunds fast. TaxSlayer is the hands down favorite software for people who need their refund fast. The $1,000 advance can be a game changer for filers who want to use their returns to pay off holiday credit card debt or to invest in a business. In an ideal world, most tax filers wouldn’t need to count the days to getting their tax return, but in the real world this matters. Aside from this group, the video tutorials make TaxSlayer a good option for first-time filers, especially those who have complicated taxes. The Premium or Self-Employed options can be a cost effective option for people seeking support from tax professionals, or people who want the audit assistance guarantee. H&R Block Free is still our top choice for free filers (since it allows for more deductions and credits), TurboTax still offers the most intuitive interface (with the most import options), and CreditKarma is still the lowest cost decent option. However, TaxSlayer is a solid choice for a lot of filers who need all the forms, need some help, and are conscious of the costs. Get started with TaxSlayer for free and try it out. TaxSlayer 2018-2019 is the best tax software for those that need their refunds fast, as they offer a $1,000 tax advance online. I still have not done my 2017 tax return. I know they owe me $, can I still get it now? Please let me know! I have all my info needed to do it and I would like to do it here if I can! Please help me asap! Thank you! You can file a return for your refund within 3 years. Just go online and file. It looks like TaxSlayer is making people get their refund advance and their actual tax refund on a prepaid card this yesr. Last year you could choose to have it put into your bank account. This makes me think twice about it. Getting the card takes 5-10 days, that’s a long wait to have physical access to your advance. That’s what I’m getting out of it also. I’m not even sure how to get the prepaid card. Can anyone help with this? My refund has been accepted, I’m just having a hard time figuring out how to get the advance. I have been accepted and green dot card says should be here by the 25th. How will I know if Im approved for refund advance? Will my actual refund be loaded to the advanced card or will it be Direct Deposited into my bank account. It depends on what you signed up for when you filed. can some one tell me if you can still get the advance if you didn’t get the green dot card and used your direct deposit information instead ? No, once you submit and file with your direct deposit, you’re done and no going back. Filed and accepted on 1/30. WMR still saying processing. Has anyone received there Federal yet? Uf so, when did you fle? It’s only 2/20! You have a few days to go! What they DON’T disclose is that your Federal Refund amount must be at least $1,500 to get the Advance. This amounts to a usury tax, as you have to pay a fee for the card. Anyone who is applying for a refund advance likely needs the money for emergency expenses. I myself, was trying to use it to assist a good friend who was drastically affected by the 35 day Federal Shutdown, and couldn’t pay their rent. To omit a criteria that applies to any and ALL applications smacks of false advertising and purely bad business. BEWARE!